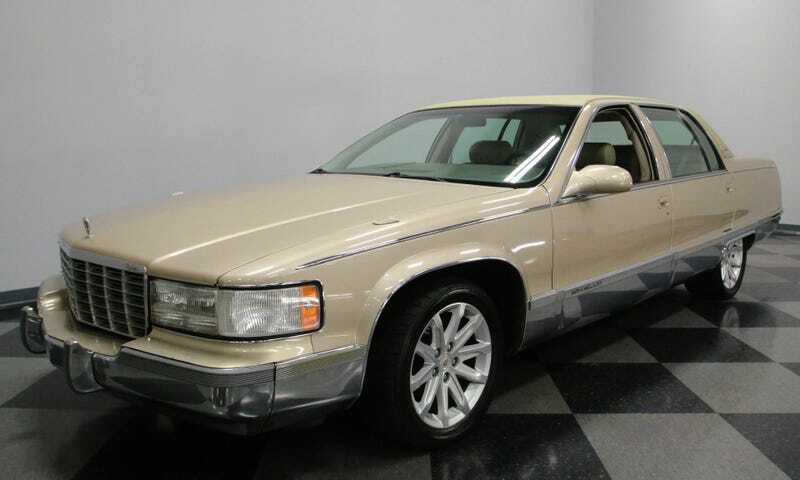 At $17,995, Would You Add This 1996 Cadillac Fleetwood To Your Fleet? Do you require coffee or some other sort of stimulant to wake you up? Well need no more my friends because, while today’s Nice Price or Crack Pipe Caddy may itself be a sleeper, its mods will definitely keep you awake. You know, when you consider yesterday’s Toyota MR2, and the spate of movies released the same year, 1987 was a truly great year to both slip behind the wheel and into a theater seat. What movies you might ask? Well, how about The Princess Bride, Dirty Dancing, Predator, RoboCop, Lethal Weapon, Full Metal Jacket, The Lost Boys, Spaceballs, Empire of the Sun, and—my own personal favorite—Planes, Trains & Automobiles. Geez, 1987 was some kind of wonderful, which interestingly enough was also a title released that year. This of course begs the question—has that 1987 Toyota MR2 held up as well as have all those wonderful flicks from the same year? Sadly, the answer is no, as the MR2 was in need of some spit and polish. But while movies are generally forever consigned to static clelluloid, DVDs, or Russian shaky cam digital rips on sketchy Websites, cars like that MR2 can be rejuvenated. That’s a good thing since that MR2, while intriguing, carried that taint of impending repair needs with it. The windshield needed replacing, while the trans wasn’t going to be fulfilling its mission much longer. That resulted in the seller asking a modest $2,500 for it, and that resulted in the car taking home a narrow but decisive 56-percent Nice Price win. That’s what I call a happy ending. We’re not about endings just yet, however. In fact, we’re just getting started talking about this 1996 Cadillac Fleetwood. It’s not often that a model that once switched to FWD makes the trade back to RWD, but that’s just what Caddy did with the Fleetwood in 1993. The GM luxo brand made the move from the lugubrious FWD C-body to the RWD D-body, and as we all know, everybody loves getting the D.
The cars were built in GM’s Arlington Texas plant, fitting since everything’s bigger in the Lone Star State, At the time the Fleetwood was the longest production car in America. The Fleetwood’s styling is also pretty much over the top, with chrome rockers that are all Fred Mertz pants high, pointy taillamps in actual fins and a vinyl roof that, with the car’s aircraft style doors, looks like an ill-fitting toupée. This one, in anonymous beige (actually I think that’s Light Sandrift Metallic) seems to be in pretty good shape for its age. There is some rub-off on the rubstrips around the car, but then that’s what they’re for, right? The paint still holds a shine and the top still remains intact. And hey, aren’t those CTS wheels underneath? What’s that all about? Well, there’s more to this Fleetwood than meets the eye. These cars originally came with a 5.7-litre LT1 under their double ZIP Code-demanding hoods. This one still rocks an LT1, however it’s been stroked to 383 cubic inches. It also comes with a hot cam, ported aluminum heads, an opened exhaust and the ubiquitous K&N cold air intake. All that conspires to give the car a claimed 440 brake horsepower. As Homer Simpson once said: “Hoo-hoo, hee-hee, ha-ha, oh my.” Quite remarkably, even with all those horses packed in there, the car still has a ton of room in the engine compartment. That hot rocker under the hood is nice and all, but it’s not this Fleetwood’s greatest claim to fame. No, the pièce de résistance, or as we say here in America “I’ll make room for dessert” is the ZF six-speed manual behind that horsey V8. That gearbox is said to have been recently rebuilt and sends its power minions through a custom three-inch aluminum driveshaft to an Auburn LSD rear end sporting 3.73 gears. Upsized sway bars on either end help keep the boat afloat, but you know this still isn’t going to handle like a Miata. The interior comes with acres of leather marshmallow seats and that incongruous stick sprouting from the tunnel. There’s power everything in here, although surprisingly no moonroof of any kind. You do get a fancy neon green digital dash, and that’s assisted by a column-mounted ScanGauge II tool. The car reads 100K on the clock and is offered by a private seller through a consignment dealer. The ad does not note the status of the title, however if you’re in the market for something this wildly weird you likely wouldn’t care if it had a salvage title or even a witches curse, you’d just want it. That is of course, if you feel it’s worth that $17,995 asking price. This is a lot of car for those bucks—literally a lot of car as it’s one of the last of the galaxy class destroyers ever sold. In fact, a little Darth Vader doll on the dash of this would seem totally apropos. But is that price? What do you think, is this cool Caddy worth $17,995? Or, even with its sleeper drivetrain, is this a Fleetwood that would have you emphatically saying I wouldn’t? Streetside Classics, or go here if the ad disappears. H/T to Claywf for the hookup! At $2,500, Could This Imperfect 1987 Toyota MR2 Be Your New Mister?